Nutrition is more than just putting kibble in a bowl. Standard Process Veterinary Formulas help bridge the gap created by the processing of foods. 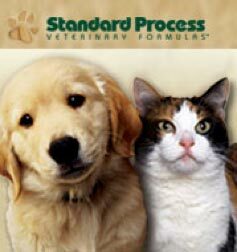 Standard Process supplements are made from whole food ingredients your pet would instinctively eat. These ingredients deliver the full spectrum of nutrition in its natural form. When your veterinarian chooses a Standard Process Veterinary Formula, they are providing your pet with essential nutritional complexity. Since 1929, Standard Process has been dedicated to the field of nutritional supplements and the whole food philosophy. In 2002, our Veterinary Support formulas were created by a veterinarian with this same philosophy in mind. The goal of nutritional support is to provide complete nutrition to each cell, restoring normal metabolic function. Whole foods contain hundreds of biologically active compounds, including enzymes, phytonutrients, and amino acids. When left intact, whole food nutrients are more available and active than isolated nutrients. Nutritional requirements can vary greatly from one animal to another. Whole food supplements enable the body to compensate for these individual differences by providing a full complement of nutrients. With whole food supplements, the body can pick and choose needed nutrient substrates without overloading any one system or organ. At our office, we believe that given the proper nutrition, your pet has the amazing capability of keeping itself healthy. We also believe that nutrition should be individualized to meet each patient’s needs. For these reasons and many more, we proudly recommend Standard Process Veterinary Formulas. Learn more about Standard Process at http://www.standardprocess.com.